Born in North Carolina and raised in Central Florida, Charles London has been a New Orleanian since 1975. He received degrees from Delgado and the University of New Orleans while working full time. Charles has a broad range of experience having been a driver salesperson for a major oil company, a chauffeur for a local limousine company, a Safety and Human Resource Supervisor for a local food distributor, and is presently employed with a major railroad. Many say he is a very lucky man having married his wife Brenda in 1983 and been blessed with their daughter Laura in 1989. Charlie and his family were one of the thousands affected by "the storm". They returned home to find flood waters had invaded their home near Tulane University. With the help of construction friends, family, and insurance proceeds his family gutted, renovated, and then sold their home of 15 years. The floor to ceiling renovation was finished in April, 2006. You can see the results at http://www.katrinafilm.com/welcomehome.wmv Charlie, Brenda, and Laura moved to the Faubourg St. John neighborhood in November, 2005 along with Brenda's Mom, Betty whose home in Chalmette was a total loss after "the storm". 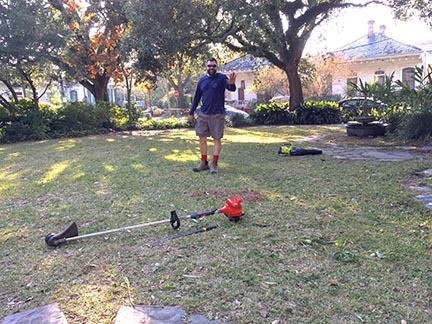 He is currently a board member of the Faubourg St. John Neighborhood Association and the Louisiana Landmarks Society. You may have seen Charlie around the neighborhood early in the morning with packs of flyers in hand. He has printed and distributed flyers for numerous neighborhood activities. Some people have an aversion to flyers on their windshield but please don't run him over, he means well! Gambit had this to say, “The bikes will be available 24 hours a day at kiosks throughout the city. Riders will have to download a smartphone app and start an account to access the bikes. A monthly pass is $15, which covers up to one hour of riding a day. The city also will offer a pass for low-income riders at $1.67 a month ($20 a year). There also is a “pay-as-you-go” rate for $8 per hour of use. The Blue Bikes are ready to roll near on Jefferson Davis Parkway near Bayou St. John. Just down the street from Parkway Bakery on Hagan St.
Bike Share Phase 1 Map Released! 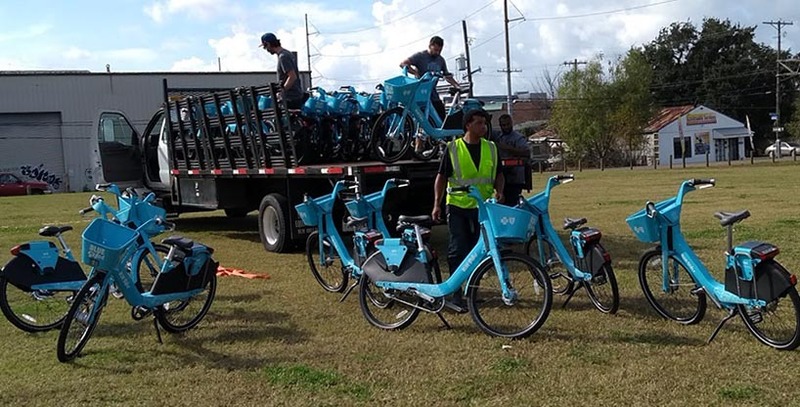 The City of New Orleans, in partnership with Social Bicycles, Inc (SoBi), launched bike share on December 5, 2017. It’s a new and affordable transportation system for residents to move through the city. Bikes and stations are available and will roll-out in waves over 4-6 weeks. Click the image below to download a map of the initial 70 stations. Click here for an interactive map. To learn more about how these locations were identified, check out the Station Siting section. Bike share service has launched with stations and bikes rolling out over 4-6 weeks. The launch schedule has been updated in the Station Siting section. Results from the online poll have been published in the Documents section. Why is bike share great for New Orleans? How will station locations be determined? Bike share is a fun, healthy, and convenient transit option that is already operating in many major cities across the country and around the globe. Bike share technology offers online and on-the-spot opportunities to reserve and rent a bike that will take you where you need to go. At the end of a journey, just drop it off at the nearest bike share station. You can pick up another when you need it next. Bike share is growing rapidly worldwide as a popular and fun transit system. It has been shown to encourage people to drive less, support local business, improve street safety, increase personal health, and enjoy the community more. The goal is to provide a seamless, sustainable, and affordable mode of transportation. It is designed to serve all residents, improve neighborhood quality of life, and provide year-round, equitable access to worksites and destinations. Many people think of biking as a recreational activity or something for kids. In fact, biking is an easy and often faster way to make shorter trips, usually under three miles. Whether it’s for work, school or running errands, bike share means you always have a bike available as an option for those shorter trips. The more you bike instead of drive, the more money you can save on your transportation costs. In fact average spending on vehicles (including purchase, fuel, maintenance and insurance) cost households about $708 a month! The bike share program will cost $15 a month (and even less for low-income residents). That’s a lot more money for things you need and want. There are many reasons people resist riding bikes. Owning and maintaining a bicycle is a big one. Even if you have a bike already, many time you find yourself without one and wishing you could make a short one-way ride. Bike share solves these problems. It’s an easy way to try riding to work without committing to owning one. Say you drive downtown to work, imagine where you could go for a quick trip during the day without having to park again! Grab lunch or run an errand. Several researchers have found big increases in people new to bike riding as a result of have bike share available in their community. Transit integration is a vital component to bike share. Many trips on transit can be made easier with bike share by eliminating a long walk or transfer to another bus or streetcar to get to your final destination. In some cities , transit use has even increased as a result of adding bike share. Best practices in placing bike share stations strongly recommend identifying locations that are directly visible from busy bus and streetcar stations for easy connection between systems. Just as bike share can seamlessly connect with transit, it also works with cars. Some people may find they are close enough to give up driving altogether. A 2015 study of four North American cities show bike share participants drove 25% to 52% less. While many people may find it easy and convenient to just use bike share, many people still need to their car to get around, particularly for long distances. However, once parked, bike share makes for a very convenient way to move around, particularly in parts of the city where parking is difficult or expensive. Bike share can also allow someone to park a little further away and avoid parking meters and tickets. Not only can biking regularly reduce monthly transportation expenses, but new research finds people who ride bikes actually spend more in local stores than people who drive. Travelling by bike means noticing more around you. And even though people sometimes don’t spend as much on each trip (bikes have small baskets) they shop more often, putting more dollars into the local economy. Business immediately next to bike share stations have also seen big boosts thanks to a steady supply of potential customers. No need to drive to the gym – biking from A to B keeps you active and moving without requiring separate time for fitness. Active commuting has been shown many times over to reduce stress and improve overall well-being. When you can ride a bike for your commute to work or even to run an errand, you feel much more joyful. The hassle and stress of traffic and finding parking is behind you. Biking connects you to your community in a completely different way that makes any trip feel fun. 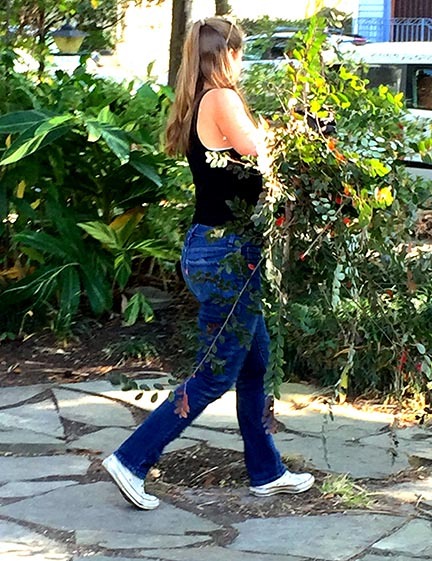 Fortier Park is maintained and beautified by helpful neighbors. This afternoon (Sunday, December 3, 2017), a small group of motivated folks appeared in Fortier Park (Esplanade and Mystery) with a mission. Today’s event arose spontaneously because residents felt action was needed to deal with an anti-social element which has moved into the park dropping trash and behaving badly. Fortier Park has been lovingly maintained by neighbors for decades. The presence of positive community action seemed to dissuade the rowdies from using the park. Primary organizers Eric Kugler and Andy Ryan were joined others who had been following a discussion on the NEXTDOOR social media site. There seems to be a team developing and I expect that a potential will be tapped for re-engagement of the community in that park. 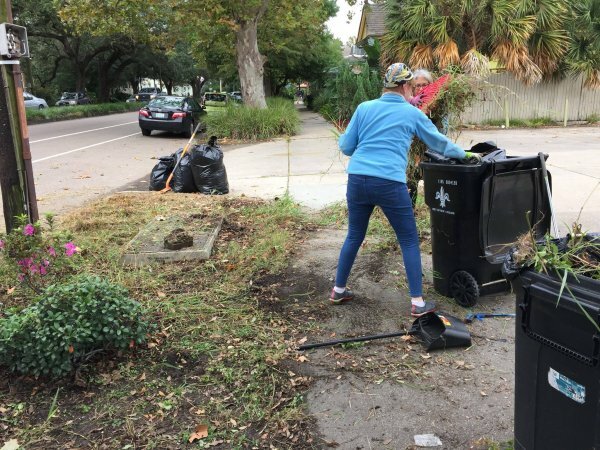 Opportunity to Join the Green and Clean Team at 10 a.m.
Fall is here and it’s time again to rally around our little pocket park – Capdevielle Park. The past couple of years we have made major progress there, and if we maintain this pace, we will have created a very special neighborhood place. Your efforts coupled with your neighbors are making a difference. TODAY, Nov 18 (also mayoral election day) we will assemble between 10am and 2pm, leaving plenty of time to vote. 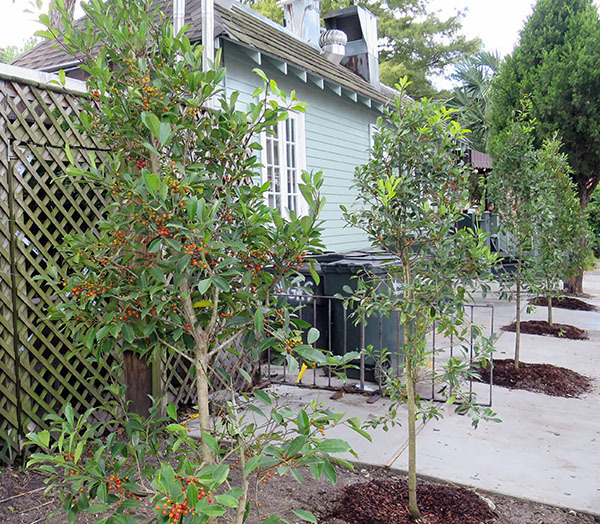 Various tasks from litter removal to plantings are planned to involve folks at many levels. Unfortunately a few regulars are out of town, so I hope we can find some new partners for our team – we always do! So invite a neighbor and bring a rake. 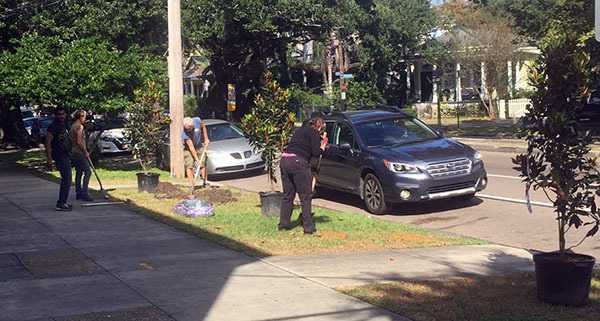 Photo above of volunteers planting trees is from SOUL NOLA’s Facebook page. 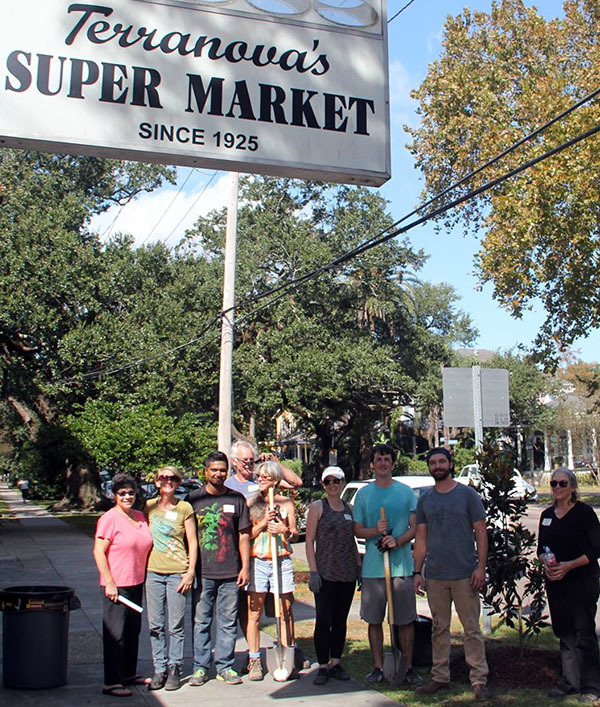 Both Terranova’s and Cafe Degas participated in the November 4, 2017 tree planting organized and sponsored by the group Sustaining Our Urban Landscape (SOUL) founded by Susannah Burley. 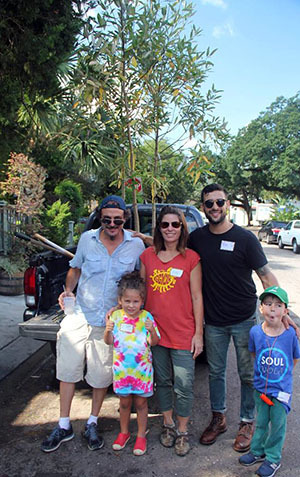 Faubourg St. John neighbors at 2816 Grand Route Saint John, 2934 Grand Route Saint John, and 2832 Ponce de Leon also received free trees. What exactly can I put in my recycle bin? SECOND SATURDAY OF EACH MONTH | 2829 ELYSIAN FIELDS AVENUE | 8:00 a.m. – 1:00 p.m.
DECEMBER 9, 2017 – SHRED DAY- Limit 50 lbs. APRIL 14, 2018-SHRED DAY- Limit 50 lbs. JULY 14, 2018-SHRED DAY- Limit 50 lbs. OCTOBER 13, 2018-SHRED DAY- Limit 50 lbs. DECEMBER 8, 2018-SHRED DAY- Limit 50 lbs. SATURDAY, MAY 12, 2018 – FROM 8:00 A.M. UNTIL 1:00 P.M.
**These items should never be placed in garbage or curbside recycling carts or bins. 240-0380 III Monday – Friday: 7:00 a.m. – 5:00 p.m.
River Birch Landfill 2000 South Kenner Rd. 436-1288 II Monday – Friday: 5:00 a.m. – 5:00 p.m.
Saturday: 6:00 a.m. – 5:00 p.m.
436-1632 III Monday – Friday: 6:00 a.m. – 5:00 p.m.
N. O. LA 70129 (504) 206-9298 Monday – Friday: 8:00 a.m. – 5:00 p.m.
HOW LONG WILL OUR TRASH BE AROUND? 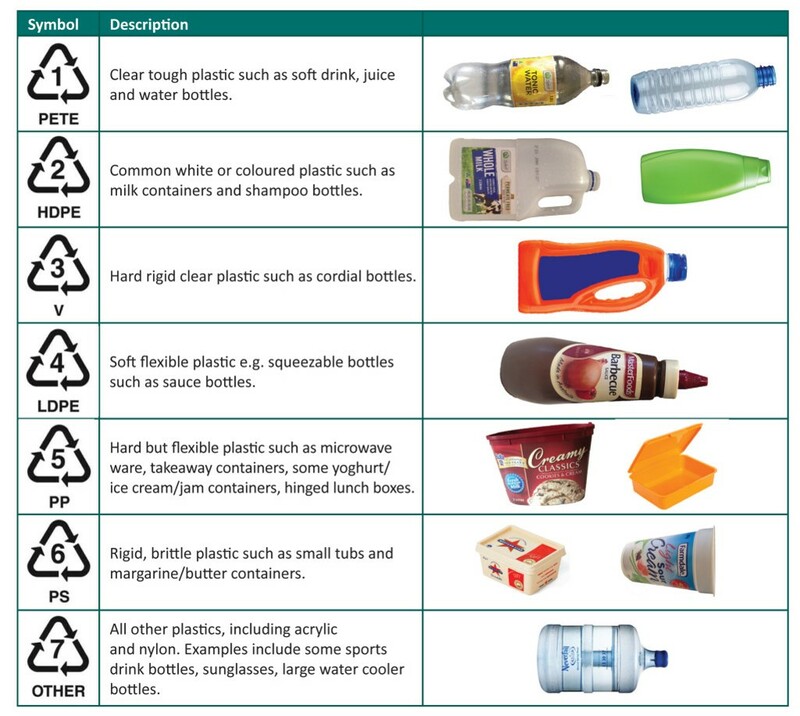 Do not litter or place signs on public rights of way such as neutral grounds or utility posts or boxes. Properly contain solid waste for collection and remove carts from the public rights of way once emptied. Ensure that all permanent dumpsters are screened from public view. 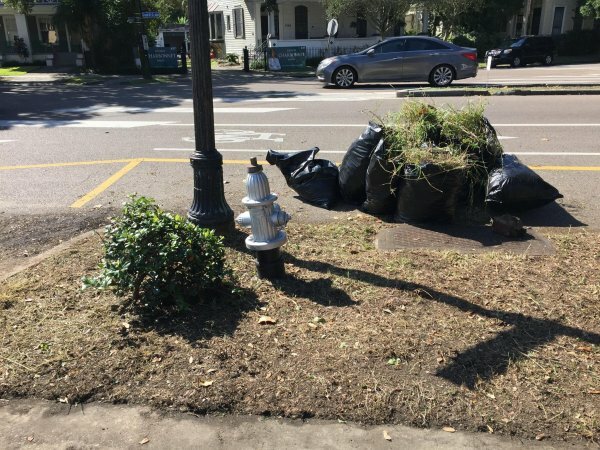 Cut grass and remove litter, grass cuttings, and leaves from properties, extending 1.5 feet from the curb. Grass should not be allowed to grow above 18 inches in height. Do not sweep, blow, or pour items into storm drains. Water from storm drains flows into Lake Pontchartrain. Do not keep more than 20 tires on a property and do not transport more than 20 tires, unless specifically permitted by the Louisiana Department of Environmental Quality. If hauling garbage, trash or other loose items in vehicles, securely cover the contents. New Orleans is the first city in the nation to recycle cigarette butts. Many years ago, I purchased a Dat Way sign. I put it up on the side of the house and received many inquiries about where to get one. The Dat Way sign on my house has been photographed hundreds of times especially during Jazz Fest. 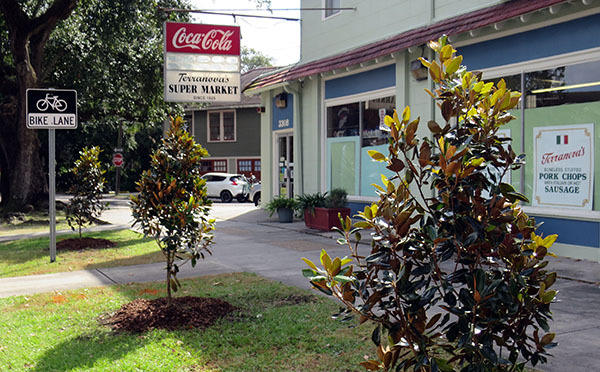 Faubourg St. John neighbor Mark Laiche came up with the idea for the signs as a way to raise funds to support programs for people with autism. All of the products and shipping material for the Dat Way and Dat City brands are locally produced in the Greater New Orleans area and Mark and his wife Terri love to support local artists, products, and ideas. Mark and his wife Terri now have a website where you can purchase all manner of Dat City Stuff. Esplanade public right of way returns to “civilized” levels. Fire hydrant discovered! Planted shrubs uncovered! 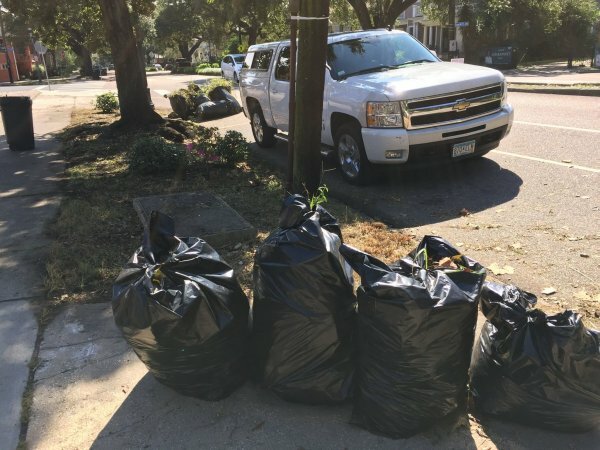 Trash removed, all thanks to volunteer efforts. At 10 a.m., on Saturday, October 28, 2017, Robert Thompson led the charge for a FLASH-CLEAN! 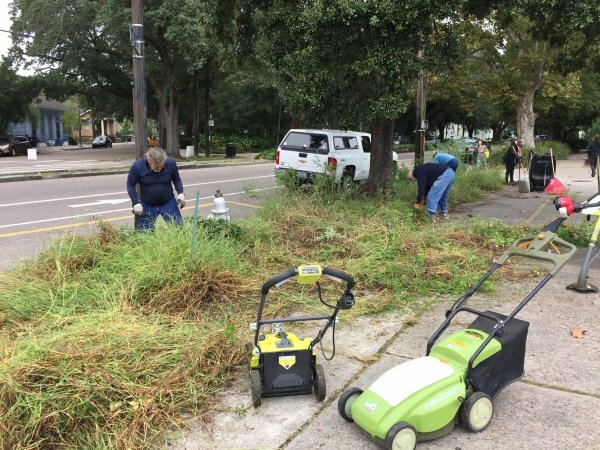 Neighbors met in front of the old Circle K-Half Shell (3101 Esplanade) and mowed, trimmed and cleaned the right-of-way on Esplanade. Robert said he was tired of visitors seeing this mess. Many hands made quick work. Robert brought supplies and tools as did the neighbors who participated. The City Beautiful Committee struck and the area is much nicer now. This area on Esplanade at Grand Route Saint John needed attention. 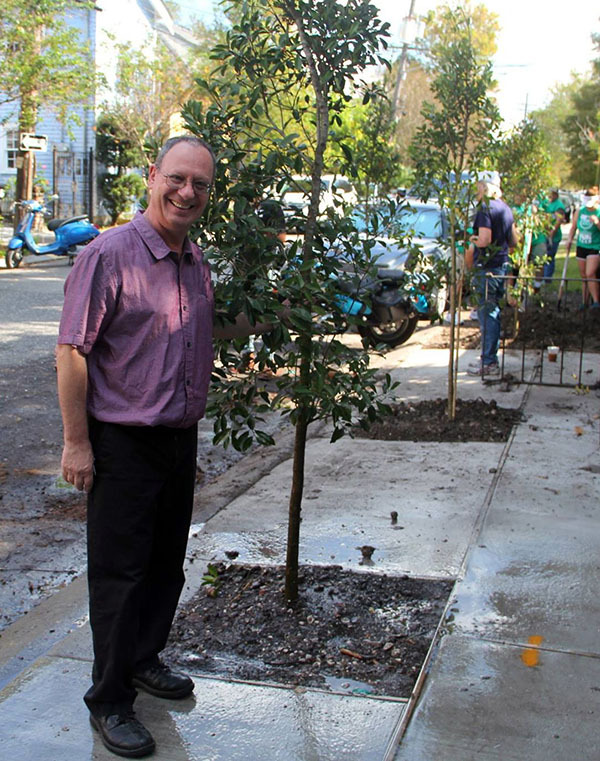 Robert Thompson organized neighbors to give the area some love. 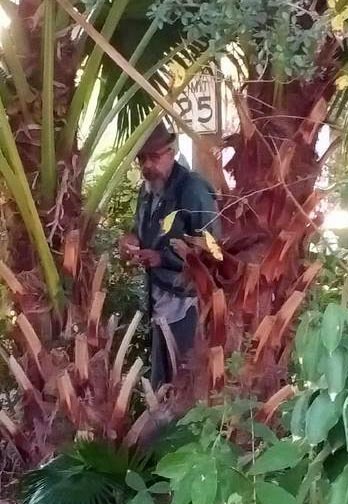 Brod Bagert uncovers fire hydrant and hawthorne bush previously lost to the thicket. Despite a claim to advanced years, Brod tackled the weeds like a young whippersnapper! Sally and Catherine knock down blight. They rescue a blooming azalea from the choking weeds! about a dozen bags of trash. 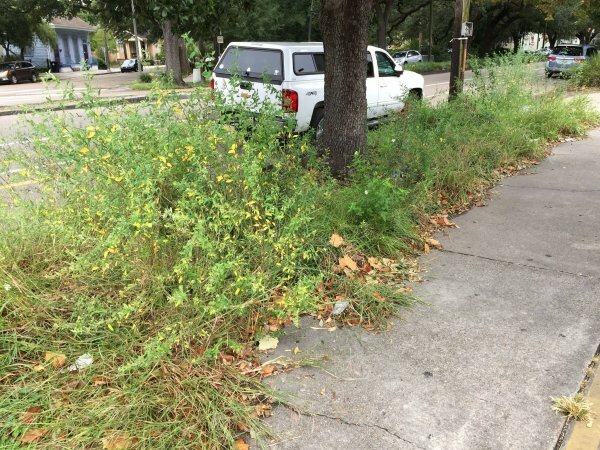 Now visitors can see Faubourg St John and not think it’s unkempt. Fire hydrant and Indian Hawthorne finally see the light of day again. Thanks to all who helped!